After 40 mins take out eggplant from oven and let it cool. Then peel off the skin and mash the eggplant well. Heat oil in pan. Add mustard seeds, pinch of asafoetida, cumin seeds, curry leaves and let them crackle. Then add chopped onion and saute till onion becomes translucent. Add minced garlic and saute for few seconds. Add chopped tomato and saute till it gets mashed up with onion. Then add red chilli powder, turmeric powder, coriander powder, cumin powder, garam masala and salt to taste. Saute till oil starts to separate. Add mashed eggplant and mix well with spices. Reduce the heat and cover the pan. Let it cook for 6-8 mins. Stir in between. Finally add chopped cilantro and serve hot with chapati. 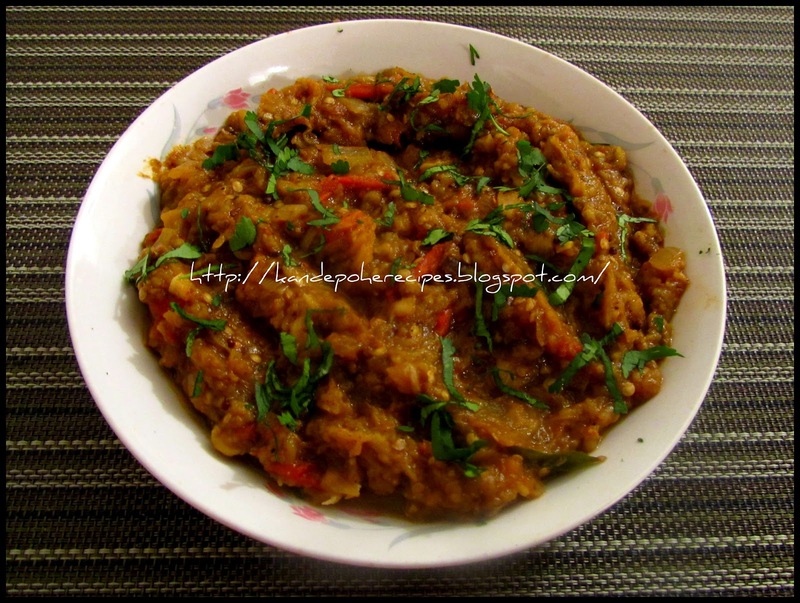 Bainga Bharta is my all time favorite. Perfectly done Poonam. The first time I made this I had baingan mash all over my kitchen. Never tried it hence. This recipe make sme want to try it again..! Thanx for sharing. Poonam, what do I say.. You did it again.. Simply a dish that I thoroughly relish, but can never eat much due to an allergy on eggplants.. Thks for the visio.. Delicious baigan barta ,yummy with chapathis!! Looks delicious dear, it's been a long time since I made this, very tempting..
super inviting curry !! very tempting one !! but it looks so freakilyciously yummy!! This looks so divine and authentic...YUM! Love you space dear..lots of yum recipes.